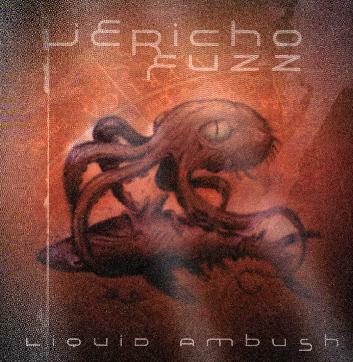 Jericho Fuzz - "Liquid Ambush"
Jericho Fuzz is a strange gathering of survivors of the Helsinki underground rock scene that have come together to make some cool, strange psych rock! It features the unique frontman, Suho Superstar from Jimsonweed, and members who were either kicked out or still remain in Hidria Spacefolk. The music is a mix of tuned down Black Sabbath meets Janes Addiction with some Rolling Stones and regular Rock and Roll thrown into the soup and some drugs. "8 Left to Try" starts the CD and has a real garagy sound and strange dynamics. Freak Rock! "Heart of the Moon" is next and the one they will play on the radio if any. Cool groove and nice slide guitar! "Little Venus" is a real foot stomping psych rocker that is very short and tripped out. "Dies Irae" is the real heavy groove one that the stoner rockers will like. "Last Mission to Earth" closes the CD and is a tuned down heroin rocker. This is a very cool new EP that will grow on you. It features 5 songs all with a unique style. Cool band. For more information you can visit the Jericho Fuzz web site at: http://www.jerichofuzz.com.